More than 86 million blog posts are published on WordPress every month. Even the most digital literate, attentive, and committed customer probably only has the bandwidth to scan about 10 headlines and read one to two articles a day – and that’s being generous. Where does that leave the millions and millions of other “content opportunities”? Floating limply in random distribution channels and woven throughout thousands of lackluster company tweets? Innovative marketers are embracing a solution – the slow content marketing movement. Much as the slow food movement argues less-but-better food will deliver improved health results, the slow content marketing movement insists less-but-better content will deliver improved marketing results. “When I first came into content marketing, fast content marketing was the way to go,” says Margaret Magnarelli, senior director of marketing at Monster and Content Marketing World speaker. “But over time, it’s struck me that there’s more value in doing fewer things. A longer piece might get fewer finishes because of its length, but it might have a greater impact on someone who ends up spending more time with it and builds greater affinity with your brand. HubSpot found that over 90% of its blog leads came from old blog posts. An American Marketing Association study found that brand marketers increased their publishing by 800% over five years only to find engagement per post declined by 89%. Orbit Media research revealed that content creators who spend longer on each post see stronger results. Publishing frequency was not a differentiator. It’s only a matter of time before every content marketing strategy goes slow to ensure that the quality of its content going out in the world is high. Slowing your content marketing doesn’t mean just pulling back on the publishing schedule. Invest the time and resources you otherwise would have put into high-frequency writing into making each article the best possible version. Though how you do that will vary depending on market conditions, here are five ways to do slow aka quality content marketing. Treat your audience like the humans they are – humans who want to read clear thinking. Push the upper limits of your budget to hire the best writer you can afford – one who specializes in your industry niche and speaks keenly to your target customer. “The quality of your ideas gives you the right to produce less,” says Mary Ellen Slayter, CEO of Rep Cap Media and founder of ManagingEditor.com. Have the necessary industry context to avoid content that your competition is publishing, to feature the latest high-quality research, and to highlight your brand’s value proposition with minimal onboarding. Have influence and authority in your industry, as your audience may be familiar with their other content. They also can amplify interest in the content through their well-developed industry networks. Know the best format, length, publishing schedule, and outreach efforts for your content and your audience. Are You Ready to Hire Quality for Your Content Team? Clickbait is a negative term, and rightfully so. Headlines that use tricks or lies to manipulate people into clicking are wrong. But the term “bait” applies to all titles by their nature – a little taste of what the content offers to entice a potential reader. If you don’t put time into creating the most accurate and alluring title, you compromise the reach of the article. Use a modified version of Jeff Goin’s formula for catchy headlines: number or trigger word + adjective + topic or audience keyword + benefit. Or use James Scherer’s tip for influencer titles: How (Familiar Brand) Is Doing (Something) to Achieve (Positive Result). Use CMI’s 10-point checklist or these headline-generator tools. Split-test your headlines using a plug-in or app on your blog and use different versions on social media. Don’t underestimate the power of your previously published content. As the HubSpot example shows, old content can be a powerful driving force for customers seeking to educate themselves about your product, service, or industry. Look at your archives and update content to make sure it’s working for your brand 24-7. One of the biggest benefits of putting more resources into a single article is that it increases your odds of creating the kind of original and editorially sound content that opens the doors to content syndication, potentially introducing your blog (and site and product) to flows of traffic from sites like MSN, USA Today, Yahoo, AOL/The Huffington Post, LinkedIn, and more. 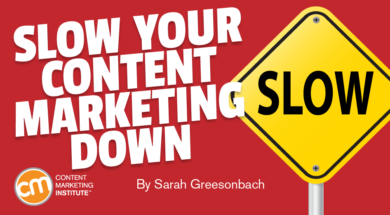 Discover how a “slow” approach also includes knowing how to develop a structured framework for your content. Make plans today to attend Intelligent Content Conference March 20-22 in Las Vegas. Register using code BLOG100 to save $100. Sarah Greesonbach is an HR, marketing, and technology writer. She loves to consider the possibilities of humanizing, organizing, and minimalizing all things marketing and HR. Connect with her on LinkedIn or follow her on Twitter @AwYeahSarah.